boson (which then decays to electron and antineutrino) is not shown. In nuclear physics, beta decay (β-decay) is a type of radioactive decay in which a beta ray, and a respective neutrino are emitted from an atomic nucleus. By beta decay emission, a neutron is transformed into a proton by the emission of an electron, or conversely a proton is converted into a neutron by emission of a positron (positron emission), thus changing the nuclide type. The beta particle and its associated neutrino do not exist within the nucleus prior to beta decay, but are created in the process. By the process of beta decay, an unstable atom obtains a more stable ratio of protons to neutrons. The stability of a nuclide to beta and other forms of decay is determined by its binding energy as a function of its numbers of protons and neutrons. The binding energies of all existing nuclides forms what is called the nuclear valley of stability. Beta decay is a consequence of the weak force, which is characterized by relatively lengthy decay times. Nucleons are composed of up or down quarks, and the weak force allows a quark to change type by the exchange of a W boson and the creation of an electron/antineutrino or positron/neutrino pair. For example: a neutron, composed of two down quarks and an up quark, decays to a proton composed of a down quark and two up quarks. Decay times for many nuclides that are subject to beta decay can be thousands of years. The two types of beta decay are known as beta minus and beta plus. In beta minus (β−) decay a neutron is converted to a proton and the process creates an electron and an electron antineutrino, while in beta plus (β+) decay a proton is converted to a neutron and the process creates a positron and an electron neutrino. β+ decay is also known as positron emission. Beta decay conserves a quantum number known as the lepton number, or the number of electrons and their associated neutrinos (other leptons are the muon and tau particles). These particles have lepton number +1, while their antiparticles have lepton number −1. Since a proton or neutron has lepton number zero, β+ decay (a positron, or antielectron) must be accompanied with an electron neutrino, while β− decay (an electron) must be accompanied by an electron antineutrino.
) is known as the daughter nuclide. β+ decay also results in nuclear transmutation, with the resulting element having an atomic number that is decreased by one. Electron capture is a competing (simultaneous) decay process for all nuclei that can undergo β+ decay. The converse, however, is not true: electron capture is the only type of decay that is allowed in proton-rich nuclides that do not have sufficient energy to emit a positron and neutrino. The beta spectrum, or distribution of energy values for the beta particles, is continuous. The total energy of the decay process is divided between the electron, the antineutrino, and the recoiling nuclide. In the figure to the right, an example of an electron with 0.40 MeV energy from the beta decay of 210Bi is shown. In this example, the total decay energy is 1.16 MeV, so the antineutrino has the remaining energy: 1.16-0.40 = 0.76 MeV. An electron at the far right of the curve would have the maximum possible kinetic energy, leaving the energy of the neutrino to be only its small rest mass. Radioactivity was discovered in 1896 by Henri Becquerel in uranium, and subsequently observed by Marie and Pierre Curie in thorium and in the new elements polonium and radium. In 1899, Ernest Rutherford separated radioactive emissions into two types: alpha and beta (now beta minus), based on penetration of objects and ability to cause ionization. Alpha rays could be stopped by thin sheets of paper or aluminium, whereas beta rays could penetrate several millimetres of aluminium. In 1900, Paul Villard identified a still more penetrating type of radiation, which Rutherford identified as a fundamentally new type in 1903 and termed gamma rays. Alpha, beta, and gamma are the first three letters of the Greek alphabet. In 1900, Becquerel measured the mass-to-charge ratio (m/e) for beta particles by the method of J.J. Thomson used to study cathode rays and identify the electron. He found that m/e for a beta particle is the same as for Thomson's electron, and therefore suggested that the beta particle is in fact an electron.
) emission from one element produces another element one place to the right in the periodic table, while alpha emission produces an element two places to the left. The study of beta decay provided the first physical evidence for the existence of the neutrino. In both alpha and gamma decay, the resulting particle has a narrow energy distribution, since the particle carries the energy from the difference between the initial and final nuclear states. The kinetic energy distribution, or spectrum, of beta particles measured by Lise Meitner and Otto Hahn in 1911 and by Jean Danysz in 1913 showed multiple lines on a diffuse background, however. These measurements offered the first hint that beta particles have a continuous spectrum. In 1914, James Chadwick used a magnetic spectrometer with one of Hans Geiger's new counters to make more accurate measurements which showed that the spectrum was continuous. The distribution of beta particle energies was in apparent contradiction to the law of conservation of energy. If beta decay were simply electron emission as assumed at the time, then the energy of the emitted electron should have a particular, well-defined value. For beta decay, however, the observed broad distribution of energies suggested that energy is lost in the beta decay process. This spectrum was puzzling for many years. A second problem related to the conservation of angular momentum. Molecular band spectra showed that the nuclear spin of nitrogen-14 is 1 (i.e. equal to the reduced Planck constant), and more generally that the spin is integral for nuclei of even mass number and half-integral for nuclei of odd mass number, as later explained by the proton-neutron model of the nucleus. Beta decay leaves the mass number unchanged, so that the change of nuclear spin must be an integer. However the electron spin is 1/2, so that angular momentum would not be conserved if beta decay were simply electron emission. From 1920–1927, Charles Drummond Ellis (along with Chadwick and colleagues) further established that the beta decay spectrum is continuous. In 1933 Ellis and Nevill Mott obtained strong evidence that the beta spectrum has an effective upper bound in energy. Niels Bohr had suggested that the beta spectrum could be explained if conservation of energy was true only in a statistical sense, thus this principle might be violated in any given decay. :27 The upper bound in beta energies determined by Ellis and Mott ruled out that notion, however. Now the problem of how to account for the variability of energy in known beta decay products, as well as for conservation of momentum and angular momentum in the process, became acute. In a famous letter written in 1930, Wolfgang Pauli attempted to resolve the beta-particle energy conundrum by suggesting that, in addition to electrons and protons, atomic nuclei also contained an extremely light neutral particle, which he called the neutron. He suggested that this "neutron" was also emitted during beta decay (thus accounting for the known missing energy, momentum, and angular momentum), but it had simply not yet been observed. In 1931, Enrico Fermi renamed Pauli's "neutron" to neutrino. In 1934, Fermi published a landmark theory for beta decay in which beta particles and neutrinos were created. This theory was the first to suggest that quantum mechanics could give particle creation. The neutrino interaction with matter was so weak that detecting it proved a severe experimental challenge. Neutrinos were finally detected in 1956 by Clyde Cowan and Frederick Reines in the Cowan–Reines neutrino experiment. The properties of neutrinos were (with a few minor modifications) as predicted by Pauli and Fermi. is a short-lived nuclide which does not exist in nature. The theory of electron capture was first discussed by Gian-Carlo Wick in a 1934 paper, and then developed by Hideki Yukawa and others. K-electron capture was first observed in 1937 by Luis Alvarez, in the nuclide 48V. Alvarez went on to study electron capture in 67Ga and other nuclides. In 1956, Tsung-Dao Lee and Chen Ning Yang noticed that there was no evidence that parity was conserved in weak interactions, and so they postulated that this symmetry may not be preserved by the weak force. They sketched the design for an experiment for testing conservation of parity in the laboratory. Later that year, Chien-Shiung Wu and coworkers conducted the Wu experiment showing an asymmetrical beta decay of cobalt 60 at cold temperatures that proved that parity is not conserved in beta decay. This surprising result overturned long-held assumptions about parity and the weak force. In recognition of their theoretical work, Lee and Yang were awarded the Nobel Prize for Physics in 1957.
where A and Z are the mass number and atomic number of the decaying nucleus, and X and X' are the initial and final elements, respectively. decay cannot occur in an isolated proton because it requires energy due to the mass of the neutron being greater than the mass of the proton. decay is not energetically possible, and electron capture is the sole decay mode. If the captured electron comes from the innermost shell of the atom, the K-shell, which has the highest probability to interact with the nucleus, the process is called K-capture. If it comes from the L-shell, the process is called L-capture, etc. are all beta-stable. There are about 355 known beta-decay stable nuclides. and electron capture) with a half-life of 7016402990552000000♠1.277×109 years. is the number of constituent antiquarks. 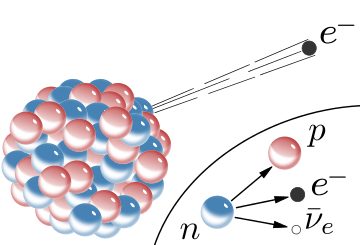 Beta decay just changes neutron to proton or, in the case of positive beta decay (electron capture) proton to neutron so the number of individual quarks don't change. It is only the baryon flavor that changes, here labelled as the isospin. All other quarks have I = 0.
so all leptons have assigned a value of +1, antileptons −1, and non-leptonic particles 0. For allowed decays, the net orbital angular momentum is zero, hence only spin quantum numbers are considered. The electron and antineutrino are fermions, spin-1/2 objects, therefore they may couple to total (parallel) or (anti-parallel). For forbidden decays, orbital angular momentum must also be taken into consideration. The Q value is defined as the total energy released in a given nuclear decay. In beta decay, Q is therefore also the sum of the kinetic energies of the emitted beta particle, neutrino, and recoiling nucleus. (Because of the large mass of the nucleus compared to that of the beta particle and neutrino, the kinetic energy of the recoiling nucleus can generally be neglected.) Beta particles can therefore be emitted with any kinetic energy ranging from 0 to Q. A typical Q is around 1 MeV, but can range from a few keV to a few tens of MeV. Since the rest mass of the electron is 511 keV, the most energetic beta particles are ultrarelativistic, with speeds very close to the speed of light. This energy is carried away as kinetic energy by the electron and neutrino. by at least twice the mass of the electron. where Bn is the binding energy of the captured electron. Because the binding energy of the electron is much less than the mass of the electron, nuclei that can undergo β+ decay can always also undergo electron capture, but the reverse is not true. where T is the kinetic energy, CL is a shape function that depends on the forbiddenness of the decay (it is constant for allowed decays), F(Z, T) is the Fermi Function (see below) with Z the charge of the final-state nucleus, E = T + mc2 is the total energy, p = √(E/c)2 − (mc)2 is the momentum, and Q is the Q value of the decay. The kinetic energy of the emitted neutrino is given approximately by Q minus the kinetic energy of the beta. As an example, the beta decay spectrum of 210Bi (originally called RaE) is shown to the right. where S = √1 − α2 Z2 (α is the fine-structure constant), η = ± αZE/pc (+ for electrons, − for positrons), ρ = rN/ℏ (rN is the radius of the final state nucleus), and Γ is the Gamma function. Other approximations can be found in the literature. A Kurie plot (also known as a Fermi–Kurie plot) is a graph used in studying beta decay developed by Franz N. D. Kurie, in which the square root of the number of beta particles whose momenta (or energy) lie within a certain narrow range, divided by the Fermi function, is plotted against beta-particle energy. It is a straight line for allowed transitions and some forbidden transitions, in accord with the Fermi beta-decay theory. The energy-axis (x-axis) intercept of a Kurie plot corresponds to the maximum energy imparted to the electron/positron (the decay's Q-value). With a Kurie plot one can find the limit on the effective mass of a neutrino. After the discovery of parity non-conservation (see History), it was found that, in beta decay, electrons are emitted mostly with negative helicity, i.e., they move, naively speaking, like left-handed screws driven into a material (they have negative longitudinal polarization). Conversely, positrons have mostly positive helicity, i.e., they move like right-handed screws. Neutrinos (emitted in positron decay) have positive helicity, while antineutrinos (emitted in electron decay) have negative helicity. The higher the energy of the particles, the higher their polarization. Beta decays can be classified according to the angular momentum (L-value) and total spin (S-value) of the emitted radiation. Since total angular momentum must be conserved, including orbital and spin angular momentum, beta decay occurs by a variety of quantum state transitions to various nuclear angular momentum or spin states, known as "Fermi" or "Gamow-Teller" transitions. When beta decay particles carry no angular momentum (L = 0), the decay is referred to as "allowed", otherwise it is "forbidden". Other decay modes, which are rare, are known as bound state decay and double beta decay. with the weak vector coupling constant, the isospin raising and lowering operators, and running over all protons and neutrons in the nucleus. with the weak axial-vector coupling constant, and the spin Pauli matrices, which can produce a spin-flip in the decaying nucleon. A very small minority of free neutron decays (about four per million) are so-called "two-body decays", in which the proton, electron and antineutrino are produced, but the electron fails to gain the 13.6 eV energy necessary to escape the proton, and therefore simply remains bound to it, as a neutral hydrogen atom. In this type of beta decay, in essence all of the neutron decay energy is carried off by the antineutrino. For fully ionized atoms (bare nuclei), it is possible in likewise manner for electrons to fail to escape the atom, and to be emitted from the nucleus into low-lying atomic bound states (orbitals). This can not occur for neutral atoms with low-lying bound states which are already filled by electrons. The phenomenon in fully ionized atoms was first observed for 163Dy66+ in 1992 by Jung et al. of the Darmstadt Heavy-Ion Research group. Although neutral 163Dy is a stable isotope, the fully ionized 163Dy66+ undergoes β decay into the K and L shells with a half-life of 47 days. Another possibility is that a fully ionized atom undergoes greatly accelerated β decay, as observed for 187Re by Bosch et al., also at Darmstadt. Neutral 187Re does undergo β decay with a half-life of 42 × 109 years, but for fully ionized 187Re75+ this is shortened by a factor of 109 to only 32.9 years. For comparison the variation of decay rates of other nuclear processes due to chemical environment is less than 1%. Some nuclei can undergo double beta decay (ββ decay) where the charge of the nucleus changes by two units. Double beta decay is difficult to study, as the process has an extremely long half-life. In nuclei for which both β decay and ββ decay are possible, the rarer ββ decay process is effectively impossible to observe. However, in nuclei where β decay is forbidden but ββ decay is allowed, the process can be seen and a half-life measured. Thus, ββ decay is usually studied only for beta stable nuclei. Like single beta decay, double beta decay does not change A; thus, at least one of the nuclides with some given A has to be stable with regard to both single and double beta decay. "Ordinary" double beta decay results in the emission of two electrons and two antineutrinos. If neutrinos are Majorana particles (i.e., they are their own antiparticles), then a decay known as neutrinoless double beta decay will occur. Most neutrino physicists believe that neutrinoless double beta decay has never been observed. 1 2 3 4 5 Konya, J.; Nagy, N. M. (2012). Nuclear and Radio-chemistry. Elsevier. pp. 74–75. ISBN 978-0-12-391487-3. ↑ Basdevant, Jean-Louis; Rich, James; Spiro, Michael (2005). Fundamentals in Nuclear Physics: From Nuclear Structure to Cosmology. Springer. ISBN 978-0387016726. 1 2 Zuber, Kai (2011). Neutrino Physics (2 ed.). CRC Press. p. 466. ISBN 9781420064711. 1 2 Jensen, Carsten (2000). Controversy and Consensus: Nuclear Beta Decay 1911-1934. Birkhäuser Verlag. ISBN 3-7643-5313-9. ↑ Chadwick, James (1914). "Intensitätsverteilung im magnetischen Spektren der β-Strahlen von Radium B + C". Verhandlungen der Deutschen Physikalischen Gesellschaft (in German). Deutsche Physikalische Gesellschaft. 16: 383–391. 1 2 3 Brown, Laurie M. (1978). "The idea of the neutrino". Physics Today. 31 (9): 23–8. Bibcode:1978PhT....31i..23B. doi:10.1063/1.2995181. ↑ C. L Cowan Jr.; F. Reines; F. B. Harrison; H. W. Kruse; A. D McGuire (July 20, 1956). "Detection of the Free Neutrino: a Confirmation". Science. 124 (3212): 103–4. Bibcode:1956Sci...124..103C. doi:10.1126/science.124.3212.103. PMID 17796274. 1 2 Segré, E. (1987). "K-Electron Capture by Nuclei". In Trower, P. W. Discovering Alvarez: Selected Works of Luis W. Alvarez. University of Chicago Press. pp. 11–12. ISBN 978-0-226-81304-2. ↑ "The Nobel Prize in Physics 1968: Luis Alvarez". The Nobel Foundation. Retrieved 2009-10-07. ↑ Alvarez, L. W. (1937). "Nuclear K Electron Capture". Physical Review. 52 (2): 134–135. Bibcode:1937PhRv...52..134A. doi:10.1103/PhysRev.52.134. ↑ Alvarez, L. W. (1938). "Electron Capture and Internal Conversion in Gallium 67". Physical Review. 53 (7): 606. Bibcode:1938PhRv...53..606A. doi:10.1103/PhysRev.53.606. ↑ Alvarez, L. W. (1938). "The Capture of Orbital Electrons by Nuclei". Physical Review. 54 (7): 486–497. Bibcode:1938PhRv...54..486A. doi:10.1103/PhysRev.54.486. ↑ T. D. Lee; C. N. Yang (1956). "Question of Parity Conservation in Weak Interactions". Physical Review. 104: 254–258. Bibcode:1956PhRv..104..254L. doi:10.1103/PhysRev.104.254. ↑ C. S. Wu; E. Ambler; R. W. Hayward; D. D. Hoppes; R. P. Hudson (1957). "Experimental Test of Parity Conservation in Beta Decay". Physical Review. 105: 1413–1415. Bibcode:1957PhRv..105.1413W. doi:10.1103/PhysRev.105.1413. ↑ "The Nobel Prize in Physics 1957". The Nobel Foundation. Retrieved March 24, 2015. ↑ Loveland, Walter D. (2005). Modern Nuclear Chemistry. Wiley. p. 232. ISBN 0471115320. ↑ Tatjana Jevremovic (21 April 2009). Nuclear Principles in Engineering. Springer Science & Business Media. p. 201. ISBN 978-0-387-85608-7. ↑ "Interactive Chart of Nuclides". National Nuclear Data Center, Brookhaven National Laboratory. Retrieved 2014-09-18. ↑ "WWW Table of Radioactive Isotopes, Copper 64". LBNL Isotopes Project. Lawrence Berkeley National Laboratory. Retrieved 2014-09-18. ↑ "WWW Table of Radioactive Isotopes, Potassium 40". LBNL Isotopes Project. Lawrence Berkeley National Laboratory. Retrieved 2014-09-18. 1 2 3 Kenneth S. Krane (5 November 1987). 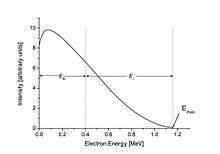 Introductory Nuclear Physics. Wiley. ISBN 978-0-471-80553-3. ↑ Nave, C. R. "Energy and Momentum Spectra for Beta Decay". HyperPhysics. Retrieved 2013-03-09. ↑ Fermi, E. (1934). "Versuch einer Theorie der β-Strahlen. I". Zeitschrift für Physik. 88 (3–4): 161–177. Bibcode:1934ZPhy...88..161F. doi:10.1007/BF01351864. ↑ Mott, N. F.; Massey, H. S. W. (1933). The Theory of Atomic Collisions. Clarendon Press. LCCN 34001940. ↑ Venkataramaiah, P.; Gopala, K.; Basavaraju, A.; Suryanarayana, S. S.; Sanjeeviah, H. (1985). "A simple relation for the Fermi function". Journal of Physics G. 11 (3): 359–364. Bibcode:1985JPhG...11..359V. doi:10.1088/0305-4616/11/3/014. ↑ Schenter, G. K.; Vogel, P. (1983). "A simple approximation of the fermi function in nuclear beta decay". Nuclear Science and Engineering. 83 (3): 393–396. OSTI 5307377. ↑ Kurie, F. N. D.; Richardson, J. R.; Paxton, H. C. (1936). "The Radiations Emitted from Artificially Produced Radioactive Substances. I. The Upper Limits and Shapes of the β-Ray Spectra from Several Elements". Physical Review. 49 (5): 368–381. Bibcode:1936PhRv...49..368K. doi:10.1103/PhysRev.49.368. ↑ Kurie, F. N. D. (1948). "On the Use of the Kurie Plot". Physical Review. 73 (10): 1207. Bibcode:1948PhRv...73.1207K. doi:10.1103/PhysRev.73.1207. ↑ Rodejohann, Werner (2012). "Neutrinoless double beta decay and neutrino physics". arXiv:1206.2560v2 . ↑ Jung, M.; et al. (1992). "First observation of bound-state β− decay". Physical Review Letters. 69 (15): 2164–2167. Bibcode:1992PhRvL..69.2164J. doi:10.1103/PhysRevLett.69.2164. PMID 10046415. ↑ Bosch, F.; et al. (1996). "Observation of bound-state beta minus decay of fully ionized 187Re: 187Re–187Os Cosmochronometry". Physical Review Letters. 77 (26): 5190–5193. Bibcode:1996PhRvL..77.5190B. doi:10.1103/PhysRevLett.77.5190. PMID 10062738. 1 2 S.M. Bilenky (October 5, 2010). "Neutrinoless double beta-decay". Physics of Particles and Nuclei. 41 (5). arXiv:1001.1946 . Bibcode:2010PPN....41..690B. doi:10.1134/S1063779610050035. Sin-Itiro Tomonaga (1997). The Story of Spin. University of Chicago Press. Tuli, J. K. (2011). Nuclear Wallet Cards (PDF) (8th ed.). Brookhaven National Laboratory.